Posh striker Conor Washington in action against Preston. Photo: Joe Dent/theposh.com. 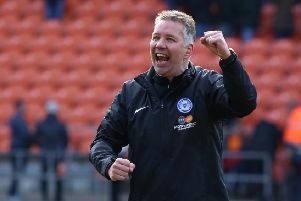 Peterborough United’s players found a trip to second-placed League One side Preston last night (March 17) predictably tougher than recent games. Few Posh players managed to win their individual battles according to Alan Swann of the Peterborough Telegraph. Kyle Vassell: (for Washington, 54 mins). David Norris: (for Bostwick, 72 mins).